It's been awhile since I posted a #ManiMonday! And it's not that I haven't been painting my nails, because I have been ... but I haven't necessarily been super inspired by any of the colors I've been using recently, either. 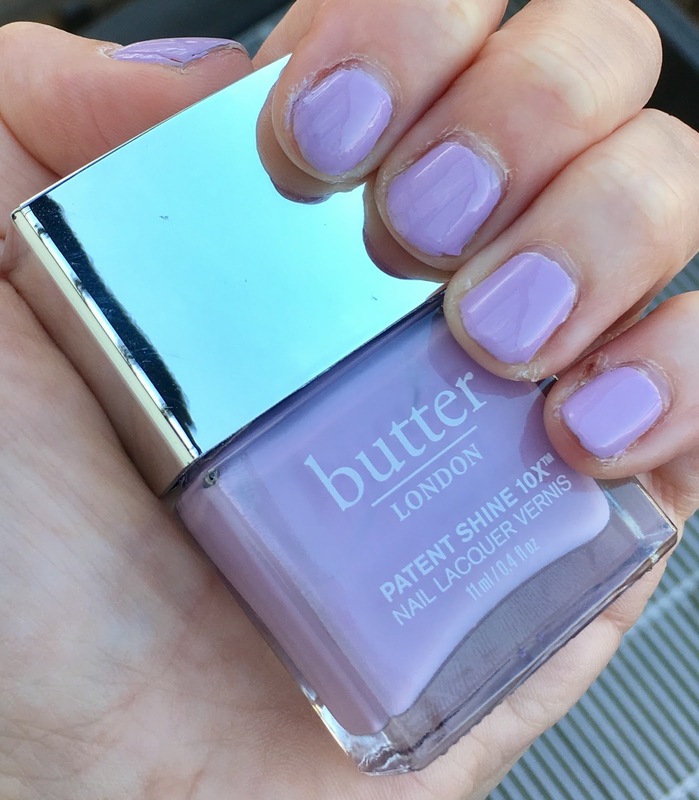 Well, that changed the moment I unearthed my bottle of butter LONDON Patent Shine 10X Nail Lacquer in English Lavender. I'm always a major lavender nail polish fan, and this gorgeous butter LONDON shade does not disappoint. This is a true lavender in every sense of the word -- light, pastel and super pretty. It's the perfect spring shade (or eternal summer shade, as I've discovered I can always wear these types of colors in LA). The formula of the butter LONDON Patent Shine 10X Nail Lacquers is undeniably better than the regular polishes from the line. I've found over the years that the regular butter LONDON polishes chip really easily -- sometimes within a day, even with base coat and top coat. But with two coats of this polish? It lasts for a week with almost no chipping! Seriously, I painted my nails with this color last Tuesday and it's still going strong -- not even a smidgen of tip wear! The end result? Gorgeous, spring-ready nails in a beautiful shade of lavender. Lovely in lavender? Yes please! butter LONDON Patent Shine 10X Nail Lacquer in English Lavender retails for $18 at nordstrom.com. Nice to know these work so well! I've only tried the regular line. Lovely purple! And the Patent Shine line is great. Lavender is such a stunning color! I absolutely LOVE lavender, and this polish is perfect! I like the Patent Shine line and this is a beautiful shade! What a pretty lavender! Perfect for Spring/Summer! I just have one Of the Patent Shine and I love it. I'll have to pull it out now that the weather is warmer. Lovely shade for Easter time and for Spring time! Seems like a very good nail polish according to the benefits that was mentioned. Impressive! I haven't tried this range from them, but I LOVE that shade!